I'm so excited to share a recipe from a book that my friend Vivi Anne recently designed and edited! She worked with her mom Lilly Robbins Brock to create it. It's full of fantastic recipes, gift ideas, and helpful tips to know around the kitchen. This is the time of year to give gifts to loved ones, friends, neighbors, and colleagues at the office. Oh, and don't forget about teachers, bus drivers, and other administrative staff if you have kids in school. Just make sure your school doesn't frown on homemade gifts.. If you have a holiday get together with family or neighbors and you serve chili, why not send them home with the spice mix that you used to create it? For years, we always used Williams Chili Seasoning for our chili at home. But since we've lived in Oregon, we haven't seen any around the stores we frequent! So, it looks like my next batch of chili will be made with the mix you see above! For more great recipes like this one, check out Food Gift Recipes From Nature's Bounty: Easy & Delicious Recipes to Make & Share for Every Occasion. You'll find more recipes for seasonings, dry rubs, cookies, cobblers, cake, pie, muffins, and many more inspiring year round goodies! 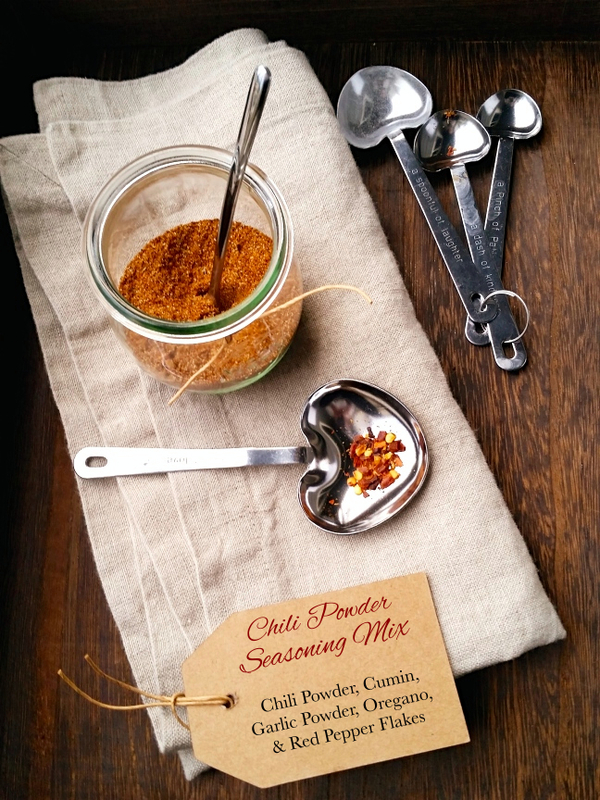 For the chili powder seasoning mix, you can find it right here. Mix together all the ingredients. Put into a glass bottle or jar with tight fitting lid. Give instructions to shake before using.